Conveniently rechargeable DLR 360 Receiver is for listen-only applications. Simple to set up and use. Features automatic mode selection and shut-off. 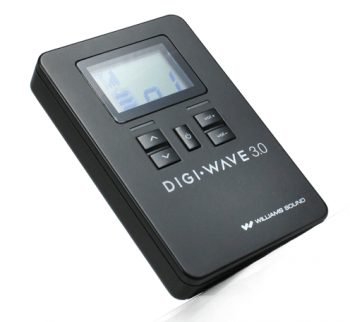 Large LCD screen displays channel, volume, battery level and RF signal strength. Receives up to two presenters simultaneously during team presentations. Can be used with earphones, headphones, neckloop or built-in speaker. Add any quantity for larger groups. Uses (2) AAA Alkaline or NiMH batteries. System includes: Rechargeable NiMH batteries optional for DLR 360 receivers (BAT 022-2) - sold separately. Note: These specifications are Preliminary and may be subject to change without notice.